When our long time client, Richard, called from the Management Company, he presented Lunt Marymor Co. with a common mystery leak problem. A homeowner reported noticing new water staining on the dining room ceiling, just below an area where waste and water pipes had been installed for a bathroom remodel, just a few years before. Surely, he insisted, a waste or water pipe was leaking. He would open the ceiling and could we come out, find the leak and make the repair? Over the years we’ve developed a protocol for diagnosing and repairing mystery leaks based on gathering as much fact-based evidence as possible prior to tearing into walls and ceilings. We treat this work like solving a “who-done-it” mystery by performing all of the detective work before we point the finger at the guilty party. The first step is to tell the client, “Hold on. Not so fast. Let us do a bit of investigation before we open things up. 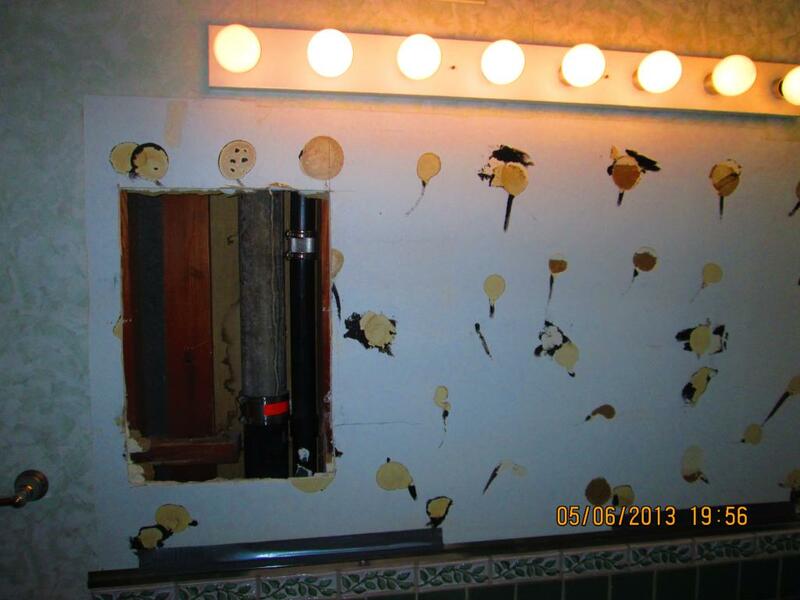 It would be great to save a sheetrock or plaster patch and paint job if we can. Of course the detective work is always easier if the leak is active and the source of the drip can be visually traced. Often, sadly, as in Richard’s case, the leak cannot be readily connected to an event that preceded it, and all of the likely building components that may cause the leak are concealed. Here are some of the tests and inspections we perform in our attempt to isolate the source of the leak. Clock the meter. When water moves through the hot and cold supply pipes in a building, the utility meter at the curb will register the consumption. Our plumber will remove the lid from the meter box and make note of the analog or digital reading shown on the meter’s dial. Having insured that no one will be turning on taps or faucets during the inspection, he’ll return to the meter in twenty minutes and note the reading again. If water is escaping from a water pipe, we will see the change on the meter reading. Check the risers. Some water pipes are only charged with water when a valve or faucet are turned on. The supply riser to the shower head or the drop to the tub spout are common examples. The plumber can remove and cap the shower head and tub spout and then turn the valve on. The water meter can be checked again to see if it is registering consumption, and the ceiling below can be checked to see if more water appears. Listen. A simple test, but in a quiet house, sometimes we can hear and trace the sound of a drip coming from within a wall or ceiling. Listening helps to locate an active leak. Test the pan. Sometimes a leak is coming through a failed liner at the shower floor (also called the shower pan). The plumber can plug the shower drain and fill the pan with water up to the level of the threshold. This test will reveal a leak if the pan has failed. Test the drain. This test isolates the shower floor drain and its piping from the pan. In this test the plumber will use a hose, or fill a bucket, to direct water into the drain while keeping the pan dry. This is a good way to isolate the shower drain line as a source of leaks. Test the waste and overflow. A tub’s drain can be tested by stoppering the tub and filling it with water. When the tub is full to a level just below the overflow the plumber will discharge the water and check for a leak below. If all is good, he’ll next refill the tub and let the rising water fall into the overflow drain. This is the best way to isolate the leak and identify if the tub drain or overflow are the source of the problem. Toilets and sinks. Similar tests can be conducted at toilets and sinks to check the integrity of their waste lines, and in the case of the toilet, the wax seal. The important note is to perform each test in sequence so that each fixture can be isolated and eliminated as a potential cause. Deluge the walls. Some leaks, in fact most leaks, are not directly related to waste and water piping. Having performed the tests that would demonstrate those pipes as a source of the leak and come up empty handed, we can move on to other sources of water intrusion. A common source is found in the tub and shower wall surround. It’s surprising how much water can wick into a wall through the smallest of tile grout gaps and cracks. The plumber will deluge the walls with water for as much as 8-10 minutes (the length time of an average shower) to see if he can force the leak to show. Many of these investigations are resolved with grout and caulk. Other sources of water. Other common sources of leaks are not caused by plumbing systems, but are weather related. Roofing membranes, gutters, eaves, exterior wall coverings, and window casings can all admit water into the building during a light rain, heavy storm, or even in a heavy fog. Once the plumbing has been forensically eliminated as the culprit, it is often time to call the roofer. Returning now to Richard from the Management Company we can report that we shared our protocols with him and he was able to perform the water tests and inspections that we’ve described here on his own. In doing so, he discovered that a small hot mopped light well drain membrane had failed, allowing moisture to enter a lower roof frame, and to drip on the sheetrock ceiling located just below all of those suspicious plumbing waste and water lines. Roofer to the rescue to install a new membrane, plumber to provide and install a new roof drain – case closed.